Hiring Staff Through The Reach Of Your Employee Network - Is It *Really* This Easy? 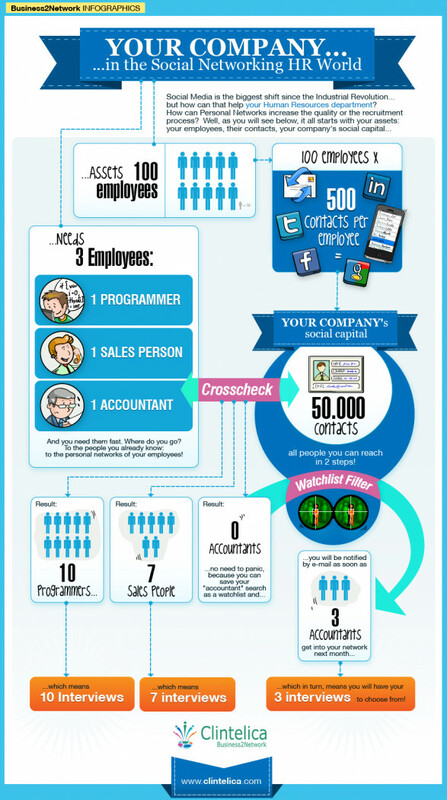 The following social recruiting infographic had my eyes twitching with disbelief! For those looking at using an employee referral approach for the first time, it seems initially to be a helpful visual. If we draw on the reach of all our employees' networks, just look at the pool of potential hires we could put ourselves in contact with! Certainly there's some truth in this - and for someone totally new to social recruiting it paints a picture of how such a strategy could work. 1. Is our employee network reach really this extensive? The first issue to address is that your candidate network is likely to be much smaller than implied above. The calculation shows that each of the 100 employees has 500 contacts, giving the business a reach of 50,000 contacts. Well this assumes that everybody in the company knows a unique set of people. The reality is that your staff all work in the same industry and your company probably hires most staff from a select pool of campuses and competitors. All of which points to there being a significant overlap in the networks of each member of staff. What's important is the number of *unique* contacts that the business can reach. I would estimate that this factor would at least halve the number of contacts a 100 person company can reach as compared with the figures presented above. 2. Is reaching out to this network really free? Let's face it, most people are not going to willingly share access to all their social networks with their employer without an inducement; and equally, they'll be reluctant to regularly forward on hiring messages without being incentivised to do so. Thus in the above analysis, either we have to assume only a fraction of the total network can be reached, or we have to factor in a cost of reaching the whole network. In most cases that cost will take the form of providing financial referral rewards to incentivise staff to forward on hiring requirements to suitable people in their network. The cost per hire is likely to be $000s, which is still a great route to hire to produce some outstanding hires - and probably cheaper than most alternative routes. But it's a cost that needs to be factored in nonetheless. 3. Is recruiting via the employee network really this easy? Perhaps the biggest disservice this infographic does is to exaggerate the ease with which this network can translate into job interviews and hires. Finding 10 suitable programmers in the network results in 10 job interviews being conducted. Really? A 100% conversion rate?! Even the most compelling of roles is unlikely to produce such a result, let alone regular job openings. If you go down the low cost route of messaging candidates, my own experiences suggest there'll be a conversion rate of <10%. Many of your messages will fall on deaf ears, reaching people who aren't looking for a job right now (or who need verbally persuading to start considering their options); or you'll successfully reach people who simply aren't prompted into taking action by the contents of your message. If you go down the more proactive and persuasive route of calling candidates sourced via this network, the conversion rate is likely to be much higher. But of course there's a significant time cost to doing so - and even the most polished recruiters are going to meet with degrees of rejection: assuming <50% candidate to interview rate across a business would be prudent in my view. For the above reasons - and a whole host more - hiring staff through your employee network isn't the quick and easy strategy that's implied by this infographic. There's a significant investment of time and / or money required that must not be overlooked. However, larger companies are increasingly seeing this channel delivering significant hiring results. So certainly do investigate this option further, just keep the realities of implementing such a program in mind. The key to success in this area of social recruiting - as with any other - is tracking of metrics to know the investment being made and the results being generated. This is important for two key reasons. Firstly, this data provides the means to track the conversions you are achieving - and therefore to tweak and fine-tune your whole approach to produce incremental improvements in the results delivered. Secondly - and more importantly - it allows for cross-comparison with other social media activities (and indeed all other recruiting strategies you are investing in). Is time and money invested in approaching our employees' networks producing a good return? Would that investment be better directed at generating a more substantial social media following for our recruiters or our corporate recruiting brand? Would creating and moderating a LinkedIn Group produce a better yield? These are the types of questions businesses need to be testing and answering to become successful in the social recruiting space.